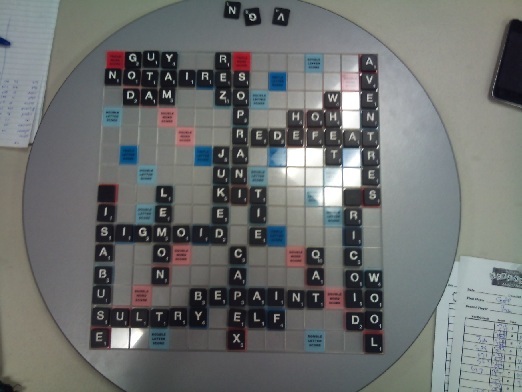 On December 13, 2012, Geoff Newman and I played a game using the Collins lexicon. Geoff triple-tripled twice leading to a final score of 751-425. SOPRANI/REDEFEAT/AVENTRES#/SIGMOID/dISABUSE for him, NOTAIRES#/eRICOID/BEPAINT for me. He even missed a sixth bingo of URGENTLY. With my last rack, I tried LIONETTE* because I knew LIONET#, so that was the only challenge. No responses yet - Leave a comment! Dave Krook had two identical racks in his game against Mark Edelson. Dave’s magic rack was DEILRS?, and he bingo-ed with DERaILS and REDIaLS. Scrabble props to Dave for bingo-ing with anagrams of the same word. There must have been eleven A’s in that game. The two Jasa , Broersma and Ubeika, played the same word three times. No blank was involved: Jason Ubeika, also known as Juju, or by the various Scrabble players of the world as Jasonu, played PIU twice. PIU across then followed by that ghastly IU dump PIU reading down from the same P. Jason Broersma, also known by the various Scrabble players of the world as Jasonb, played PIU in a separate spot elsewhere. That’s the two P’s and three of the ghastly U’s being used to play PIU PIU and PIU. They could have tried for PHEW too. Craig Rowland had a bingo-fest with eight rack-clearers. He opened with MISReLY on his first move against Shauna Petrie. His plan was to try to lure Shauna into a challenge by having her mistake his play as MISeRLY. Shauna held him, but was smart not to challenge. This was a risky play as Craig slotted the Y on the DLS. Any -ING extension to the TWS would yield an easy 45 points, but that never happened. He reasoned that it would be rare for a player to have ING sitting on his or her rack at that moment, and it would not be worth the 45 points in the end if either he or Shauna fished for it. There are only a few bingo anagrams that look like misspellings of more common words. Some that come immediately to mind are STRONGYL/STRONGLY; FORAMEN/FOREMAN; GLOBINS/GOBLINS; SALVIAS/SALIVAS. However, since tabloids posted photos of Miley Cyrus inhaling hits of salvia from a bong, this word has now entered common parlance and all the kids are talking about it. Send in more “apparent anagram misspellings”. Joseph Bowman celebrated his 44th birthday and gave two-dollar coins to all those players who scored 44 points in a turn. Congratulations to birthday-boy Joseph as well as all of the money winners: Steve, Yvonne, Andy, Sophia, Martyna and Joseph himself times two. Those of you who watch Star Trek may know that April 5, 2063 was (and will be) First Contact Day. That’s the day that the Vulcans (i.e. Spock’s race) visit Earth and introduce themselves to humans for the first time, an event prompted by mankind’s discovery of faster-than-light (FTL) travel. So, it’s fitting that this day should coincide with our club’s very own first meeting that happened on April 5th, 1993. Yesterday marked the Mississauga Scrabble Club’s 19th anniversary. In celebration of the occasion, Craig selected a couple interesting themes. First to honour the number 19, we looked to our nation’s 19th Prime Minister. She was our first–and to this day, only–female Prime Minister and appropriately, she served her stint at Sussex Drive in the summer of ’93. With a fixed election looming (fixed in the sense of timing, not scandal), her opposition Liberals’ supporters managed to OUTVOTE the Progressive Conservative crowd and thus her term came to an end. And that is the story of how our honourable, hearty soup Prime Minister, Kim Campbell, allowed me to win this week’s theme word with a meager 12-point play. The second anniversary theme came from #19 of the Toronto Maple Leafs. That’s Joffrey Lupul, a player who managed to have a fairly good season on a losing team. LUPUL is a palindrome, a word that spells the same backwards and forwards. Therefore, the best palindrome play of the night would win an additional prize. There were a few plays, AA, OHO, ABA, but the winning PALINDROMIST was none other than Vijayajiv. He managed to play three palindromes all in one turn. This is impressive in and of itself, but to make it even better, he played three SYMMETRICAL palindromes! He played AWA and formed AMA and WOW at the same time. A man, a plan, a canal–Vijay! More impressive feats were accomplished on this night. The bonus bingo letters were KI, and Dave played TALKIES for 68, while Priya, perhaps with a greater Killer Instinct, played its anagram LAKIEST for 78. I feel privileged to live in the LAKIEST country in the world. Three of the 17 MSCers in attendance managed to win all three games of the night; Mark H, Mark E, and Priya! Congratulations. In his three victories, Mark Edelson managed to put up a season high 1523 points! Easily taking him over the 12000 threshold, crossing the finish line in our race at warp velocity. For this contest, he wins $20.12 on the MSC’s 2012 celebration. Well done, Captain. One response so far - Leave a comment! Our next tournament will be held on June 16, 2012! Click here for complete details. 2 responses so far - Leave a comment! 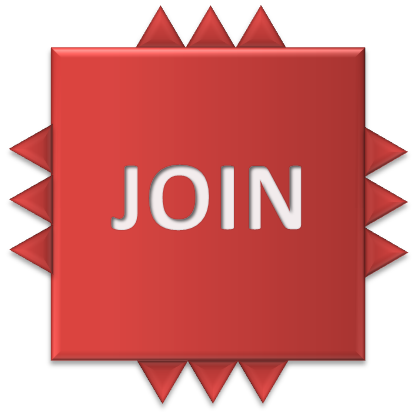 The Mississauga SCRABBLE® Club will hold its weekly meeting in an alternate location for one evening on Thursday, March 15, 2012. The Club will convene at Mississauga Valley Community Centre at 1275 Mississauga Valley Blvd (map below) at 7:30pm in the Hazel McCallion Auditorium. The following week, we will return to our normal location.